This rustic galette was a great way to use up some pears that we stocked up on at the farmers market this past weekend. It’s a simple dessert that will make a great addition to your Thanksgiving day menu. The crust recipe is from Smitten Kitchen and could not be easier to prepare. I usually get intimidated by homemade crust but I’m really happy with how this turned out. Between the sweetness of the pears, warming notes from the cardamom, and creaminess from the macadamia honey topping this is one heck of a dessert. And while it’s intended to be enjoyed after dinner this is also a great way to start the day when served with a cup of coffee. Simple, comforting and farm fresh to boot. I hope you all love this rustic galette as much as we do. Also–per a request from a reader who cannot eat cashews but really wants to try one of the nut based cream sauces (hi Carolyn! ),this one is for! Feel free to try this with a savory twist too. Go wild! Pulse the flour, sugar, salt and 2 tablespoons of the butter in a food processor until the dough resembles a coarse meal. Add remaining butter and continue to mix until the biggest pieces look like large peas. Drizzle in the water until the dough just holds together. If it needs a touch more water add it 1 tablespoon at a time. Remove from the processor and roll the dough into a ball. Flatten into a 4-inch thick disk. Place in plastic wrap and refrigerate for a least 30 minutes. Preheat the oven to 400F. Melt the butter in a small saucepan over low heat. Add the cardamom and vanilla and mix well. Set aside. On a lightly floured surface roll dough out into (roughly) a 14 inch circle (it doesn’t have to be a perfect circle,this is a rustic galette after all!) Place on a parchment lined baking sheet and arrange pear slices in a circle, overlapping about 2 inches from the edge of the crust. Fold the edges up and crimp them to hold together. Brush melted butter over the entire galette. Sprinkle the whole pie with the sugar and place on a parchment lined baking sheet. Bake until golden brown, about 45 minutes. Rotate the pan halfway through baking. While the galette is baking prepare the cream. Drain the macadamia nuts and place them in a high speed blender with the honey and vanilla. Add 1/2 cup of water and blend on the highest setting until smooth and creamy. Add additional water to thin until you reach your desired consistency. Taste and adjust seasonings as needed. 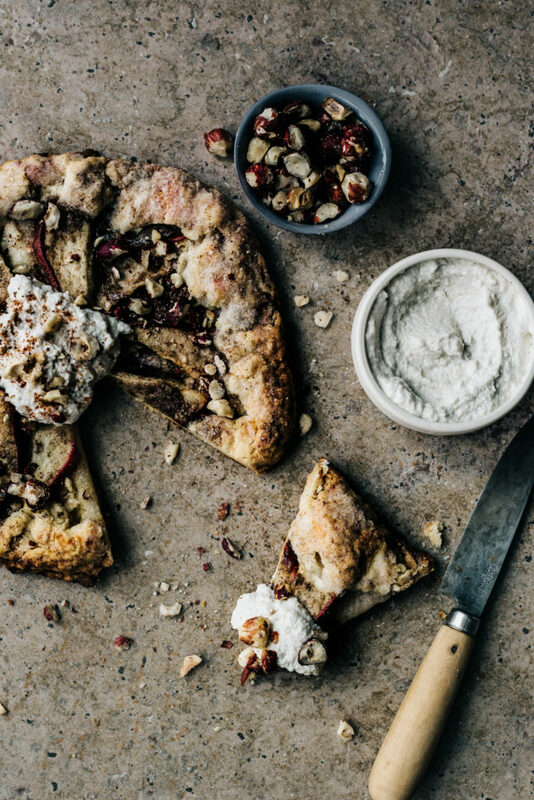 Serve galette with macadamia cream and toasted hazelnuts.